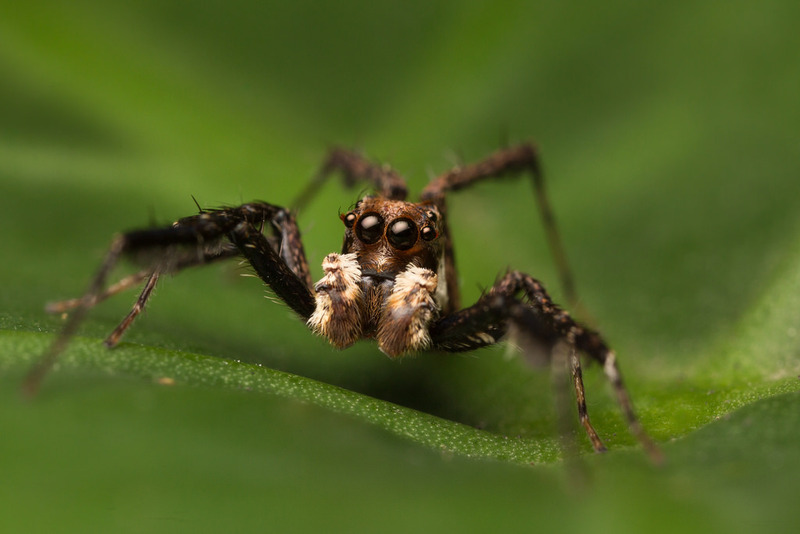 We recently published a paper in Journal of Evolutionary Biology, showing that whilst more aggressive spiders are faster decision makers than less aggressive spiders, that this speed comes at the price of accuracy in decision making when the task becomes more complex. In more complex tasks, it’s the less aggressive (or docile) spiders that make the correct choices most often. The study of animal personalities has become a very large field of study. The idea is that different individuals of a species or population might have their own behavioural idiosyncrasies that are heritable traits and influence individual fitness. Biological research is typically known for it’s ‘noisy’ data, compared with the results you might obtain in chemistry or physics research, and the study of animal personality is aimed at explaining some of this variation between individuals, or ‘noise’. Further to this, researchers have found that some important typical behaviour responses (e.g. tendency to be aggressive) consistently correlate with other behavioural responses (e.g. tendency to explore new areas quickly) in some animal species. These correlations in behavioural responses are called personalities or personality syndromes. It’s fascinating to consider how the compositions of different ‘personalities’ or typical behavioural responses, in a population, might affect how the population as a whole responds to changing environments or circumstances. One pivotal personality trait for all animals is the speed with which it makes decisions about how to act in its surroundings. The speed and accuracy of decision-making can be critical in some contexts, such as when foraging or avoiding predators. Making an accurate decision requires sufficient information, but processing this information takes time, and most decisions need to be made quickly for the decision-maker to benefit. Therefore, there is the potential for a trade-off between these attributes, where an individual may make either a fast, error-prone decision or a slow, accurate decision. In these experiments we looked at the jumping spider species Portia labiata (see picture above). Portia are an excellent specie to look at for these sorts of questions because they have interesting cognitive abilities. In some previous work by Chia-chen Chang they found that Portia labiata do have a correlation of aggressiveness with speed in decision making. The more aggressive they are, they faster they decide. But in that experiment all individuals were accurate in their decision making regardless of their level of aggressiveness – so we thought perhaps the decision they had to make in that experiment was too easy. We set out to test how speed and accuracy trade of for both aggressive and docile individuals, and how it changes depending on the difficulty of the decision-making task. We first tested the aggression level of all spiders in a mirror test. This is where the lid is removed from their enclosure and a mirror is placed where the lid was. The spiders see themselves in the mirror and think another spider is intruding on their home. The closer they get to their own mirror image the more aggressive they are deemed to be. Then we had the spiders complete two tasks – one easy and one difficult – where the objective was to get to the prey item at the top of a pole. The spiders must choose between the access pole (correct choice) and the dead-end pole with no prey (incorrect choice – see diagrams below). The difference between the tests was that in the simple test the spiders could move freely around the arena in deciding which pole was correct, where as in the complex test the arena was full of water and the spiders had to choose between the right or left headed bridge to access either pole. We found that aggressive spiders made fewer directional changes before completing the tasks, regardless of task difficulty. However, decision accuracy was jointly determined by both aggressiveness and task difficulty. Aggressive spiders made more accurate decisions in the simple task, while docile spiders made more accurate decisions in the difficult task. Therefore, it seems that the relationship between personality and decision-making style in P. labiata is context dependent. In nature, animals face various tasks involving various costs of making incorrect or slow decisions, and whether it is better to focus on accuracy or speed depends on the context. Further research on how aggressive and docile individuals use and process information from their environments across contexts, and the fitness outcomes of these differences, will provide a clearer understanding of the processes which maintain behavioural diversity within populations.